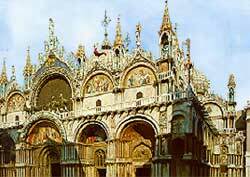 St Mark's Basilica is nicknamed "Church of Gold" because of the lavish amount of decorative gold that was used on both the building's interior and exterior surfaces. The Campanile is a freestanding bell tower rising next to the Basilica. Its 95-meter (315-feet) high profile dominated the Venice skyline for centuries. In 1902, without warning, the Campanile collapsed. It has since been reconstructed, faithful to the earlier design. You can take an elevator up to the top of St Mark's Campanile for a magnificent view of Venice.